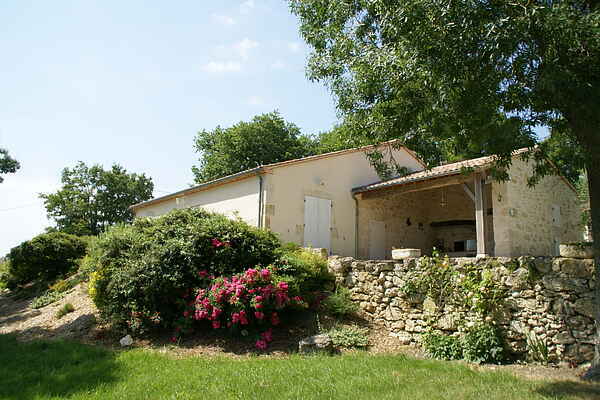 This cozy and authentic holiday home with swimming pool is situated on a hill just outside the village of Saint-Mézard. Here you will have a panoramic view over the surrounding fields and woods. The stone outer walls date back to the 16th century, but inside it is completely renovated. You would never believe this once was a ruin. All around the house you have a lovely garden full of flowers. The Roman town of Lectoure (12 km) is certainly worth a visit. On one of your walks you will pass the beautiful Cathédrale Saint-Gervais and the archaeological museum. On Friday morning you can visit the pleasant market and there are a few thermal baths. Explore the Musée de l'Armagnac in Condom (25 km). 9-hole golf course in Fleurance (25 km). Bakery and groceries in Saint-Mézard (2 km). Supermarket and bank in Lectoure. Head for the large town of Agen (26 km) where you will find several museums, including the Musée des Beaux Arts and numerous wonderful shops. And while you're in the neighborhood, let yourself be overwhelmed by the beauty of the caves in Castella (50 km), which is only a fifteen minute drive from Agen.